REFLECTIONS: A STORY OF VISUAL COMMUNICATION IN INDIA: Lalit Kala Akademi Regional Centre, Lucknow organized an Exhibition – REFLECTIONS: A STORY OF VISUAL COMMUNICATION IN INDIA in collaboration with Sri Sachin Kaluskar from 7 to 12 November 2014 at its galleries. This exhibition included the prints from various presses consists of mass-produced yet important prints of various subject-matters which serve as a device of visual communication for students, scholars and connoisseurs. The central theme of this exhibition is clearly concerns the relationship and the constant dialogue/communication between religious images, socio-political statements and their changing configuration. A good number of visitors witnessed the event. Media covered the event. Exhibition Installation Art: In its second part, the Lalit Kala Akademi organised an exhibition of the Installation art at Faculty of Visual Arts, BHU, Varanasi from 25 to 27 December 2014 on the theme - Sacred Landscape and Cosmic Geometry of Varanasi. The sale counter of LK publications was also organised. The exhibition coincided with a series of programmes of other Akademis during the Hon’ble Prime Minister’s visit to BHU, Varanasi. 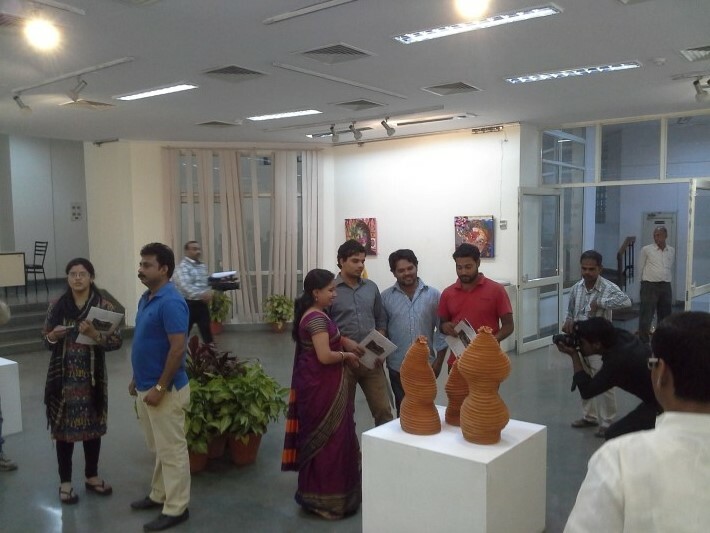 This exhibition presented ten installations done by thirty young artists from the State of Uttar Pradesh. 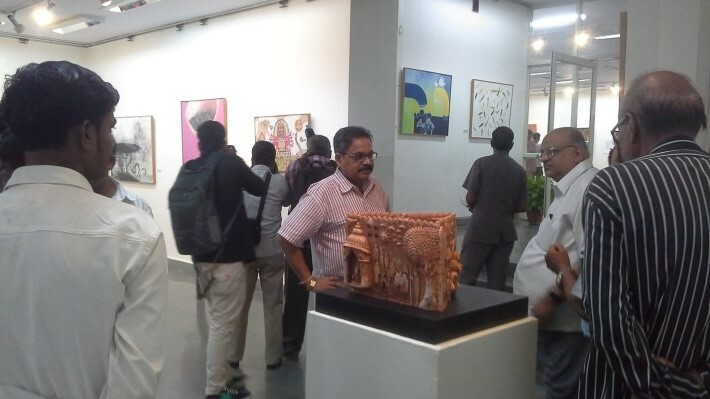 A number of art lovers, artists and faculty members visited the exhibition. 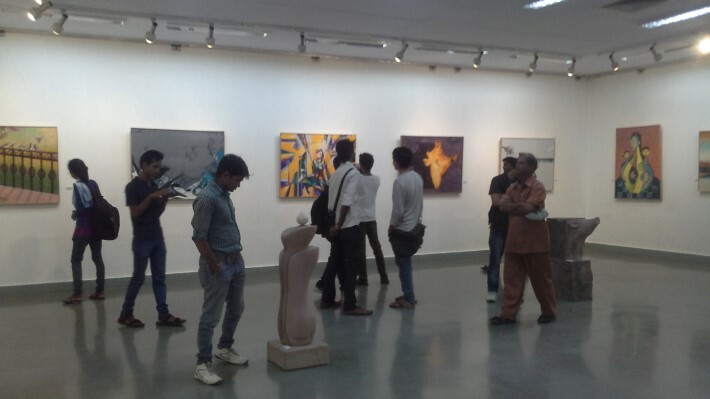 Lalit Kala Akademi Regional Centre, Lucknow organized Exhibition of Artworks of Lalit Kala Akademi Scholars 2013-14 from 12-18 March 2015 at its galleries comprising six young and upcoming scholars from the disciplines of Painting, Sculpture, Ceramics and Graphics. This opening of the exhibition was held on 12 March 2015 at 5.00 pm at the Centre. These scholars have worked in the studios of the Regional Centre Lucknow for duration of one year on Lalit Kala Akademi Scholarship. A number of local artists, art lovers and media persons attended the opening ceremony of the Scholars Exhibitions. Print and electronic media covered the programme. EXHIBITION OF ARTWORKS CREATED IN THE ARTISTS’ CAMPS AND WORKSHOPS:Lalit Kala Akademi Regional Centre, Lucknow organised an Exhibition of Artworks created in the Artists’ Camps and workshops during 2013-14 organised by LKARC, LUCKNOW from 25 to 31 August 2014 at its galleries. It was inaugurated by Dr. Ajai Kumar Pandey, Director, State Museum, Govt. of U.P., Lucknow on 25 August 2014. At this function, a number distinguished persons, artists and art lovers were present. A number of 65 art works of 57 artists were displayed in the exhibition. The Print media covered the event.